6am: Sam throws very loud tantrum in response to a ‘No’ to a fourth rusk with his tea. (Robert, it should be noted, got up early with Sam as I’d been up with him the night before and had landed up ‘sleeping’ on Sam’s bed under my dressing gown.) Feel content and well rested. Not. 8.30am Get self ready and Nina ready for school: get her dressed, remember to pack needle for sewing and swimming things, work out what the kids will eat for lunch. 8.30am to 12.25pm: Work. Facebook. Work. Make lists. Worry about budgets and underspending. Put off meeting with Guy til tomorrow. Make another list. Shuffle papers on my desk. 1pm: Take Nina and Lucy home and give all three children lunch, while sewing – yes! sewing! – on straps to the Tiger Lily costume I had made for Nina the night before. She had designed her own costume. How could I say no? 1.45pm: On Sam’s insistence, take him along on my second daily school run to fetch Babie and her two classmates from school. Return DVD. Consider dropping off my MTN application for data card. Realise it’s impossible. 2pm: Wrap Sarah’s birthday presents (from Lucy and Nina); get the girls to make birthday cards; get the girls and Sam dressed in fancy dress for ‘Peter Pan’ party. Make crown for Tiger Lily. Last-minute change to turn Sam from Superman to Pirate. Luckily he does not object to bandana being pink. 4.30pm: Tell children to finish up, it’s time to leave. Let’s go. Where’s Sam. Where’s Babie. Where’s Lucy? Where’s your jersey? No, I don’t know where you put your crown. No, you can’t eat more. Get into the car. We’re leaving! Oh, you need to pee? 5.15pm: Finally get children into car. Negotiate more sweet stuff in party packs. Get home. What’s for supper? God. I didn’t think of supper. Rolls and cheese will have to do. 6.15pm: Get Nina dressed into ballet outfit (stockings, leotard, shoes, jersey, tie up hair) and race to dress rehearsal. Hang out at dress rehearsal. 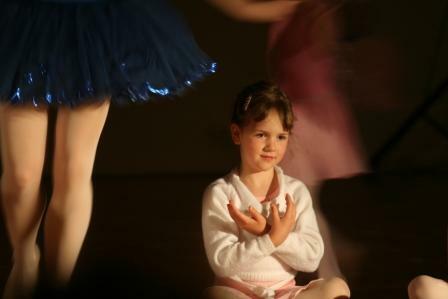 Have my heart pop at sight of little people in pink, earnestly doing ballet. Love it! Wish I had read my camera manual so I’d know how to change the ISO setting. Photos great – except of my daughter who is under the spotlight and is over-exposed. 7.30pm: Leave rehearsal. Nina delighted to be out at night and see the full moon. “The moon’s my friend, Mommy.” Why? “He has a nice face.” Pick up laptop at work, thinking I’ll write up story for school walk that’s due at Grocott’s. 8pm: Get home. Bath Nina, dress Nina, read one chapter of Peter Pan. Goodnight, sleep tight.